Recycling is an excellent way of saving energy and conserving the environment. It is one of the best ways for you to have a positive impact on the world in which we live. Recycling is important to both the natural environment and us. Habitat destruction and global warming are some of the effects caused by deforestation. Recycling reduces the need for raw materials so that the rainforests can be preserved. Huge amounts of energy are used when making products from raw materials. Recycling requires much less energy and therefore helps to preserve natural resources. We have waste bins in the greenhouses that we fill with cuttings, cut grass, left over compost, and old dead plants. These all get emptied into our compost heaps, which eventually, over time get composted down. This can then be re used as a garden mulch/soil improver. We produce about 12 cubic metres each year. That’s two large full skips not going to landfill. 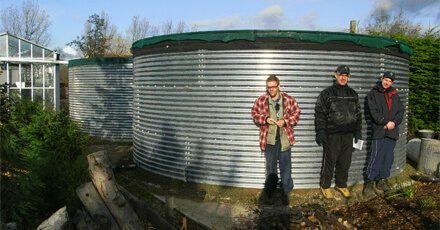 On site we have four large water tanks. These collect rainwater. Between them they hold around 30,000 gallons, that’s over 112,000 litres. We recycle this water, using it for our watering systems in the greenhouses, and in our gardens to water plants. This water is also used to flush our toilets and to clean vehicles and equipment. This saves the use of well over 1,120,000 litres of treated drinking water each year. That’s the same as the annual water used by 5 average households, enough water for 5,600 baths or 22,400 showers. We always re-use any plant pots that we have used. The students carefully remove any labels, clean and sort all of these for us to use again. Wood is recycled in many different ways at Horticap. Local tree surgeons and other trade gardeners bring us piles and piles of woodchip and logs, we use these to sell on to customers and around our site, we also use these when we go out on jobs in the community. We make bird tables and birdhouses from left over wood, we make other wooden craft items to sell in our shop. We also make our own charcoal from small logs; we sell this in the shop. In the future we would like to use wood to heat our large greenhouse. In our mess room we have a food compost bin. We compost many waste items such as teabags, banana skin, apple peel, orange peel, and plain paper. We get our compost in large plastic bags; we use the compost around the site and on jobs and this leaves lots of empty plastic bags. We reuse these by filling the bags with things like wood chip, horse manure and our own compost for customers to purchase. Our shop has uses paper bags in place of plastic. We cut up old clothes into strips. We can then make rag rugs, wreaths and swags. These look fantastic and sell very well in our shop. We work with local businesses, for example Bettys and Taylors and The Cone Exchange, recycling in the community and at Horticap. These measures have reduced our combined consumption of oil, gas and electric by around 50% – 60% each year.